Did you know dogs’ noses are wet to help them smell better? The moist surface is like a glue to help capture scents! Even though their sense of smell is good, they don’t always smell good themselves! 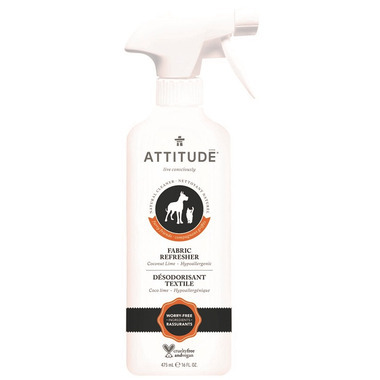 Mist ATTITUDE’s Natural Fabric Refresher on pet bedding, cushions, favourite nooks and soft toys to remove odors between washes. Lightly scented with coconut lime, and made with plant- and mineral-based ingredients, there’s no worry of them ingesting harmful chemicals. Ingredients: Aqua (solvant), Alcohol (solvant), Zinc ricinoleate (odour neutralizer), Propanediol (humectant), Sodium citrate (chelating agent), Lauryl glucoside (surfactant), Myristyl glucoside (surfactant). Directions: Spray on fabric until slightly damp to eliminate pet odors. Safe to use on most fabrics and carpets. Use in all rooms and the car for a fresh, clean scent. DO NOT use on leather, suede, silk, or fabrics that water spot. Avoid spraying on finished wood surfaces. Use it in the living area where the dog hangs out. Leaves a nice scent that is not overwhelming. We use a lot of Attitude products. Happy to add this one.